For 20 years, seminal producers, DJs and label owners, Slam, have brought a progressive and independent streak to the ever-developing techno and house scene, both in their own music and by representing other acts through their Soma records label. From beginnings as underground trailblazers, both Slam and Soma have employed the innovation and attention to detail, which, has enabled them to succeed in the state of flux persistent in the scene and helped maintain a consistently high standard of output. To celebrate this 20 year collaboration, Soma are releasing a selection of classic tracks from their extensive back catalogue, newly remixed by some of the most globally renowned and regarded producers in the house and techno scenes. The origins of this twenty year progression are brought to the fore in Somas latest single release which contains three expansive and varied remixes of Slams classic track, Eterna - the first ever release on the Soma label and year zero for the aforementioned collaboration. Eternas influence in 1991 was born through its merging of disparate styles, underpinned by a balanced mix of driving bassline and euphoric melody. Producer and label owner Radio Slave shares some of this kind of influence in the modern era fuelled by his own output and that of his label ReKids. Following an earlier remix of Slams Azure in 2007 the London based producer has again forged his imprint on Eterna with this latest remix. There is a darker, heavier feel to the remix with the rounded bass stomping between drops heavily and the manipulation of samples from the original, which are now more strung out and imposing than euphoric, adding a sense of controlled aggression. 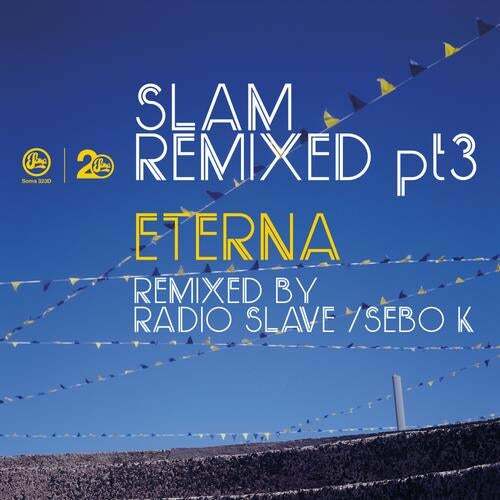 Having previously remixed Radio Slaves Bell clap dance, veteran German producer and DJ, Sebo K, turns his attention to Eterna to produce his first remix for Soma. Sebo Ks sound manifests itself clearly in the remix as the track is lifted with dynamic, shifting rhythmic patterns and a loping bassline. A focus on liquid synths smoothes and brightens the track to provide a very different interpretation and also creates a powerful and deep dancefloor remix. In the final remix on the single Radio Slave takes the helm again to provide resonant echoing bass, disjointed percussive elements and gnarled samples to provide a great beats remix of the original.